McCormick & Co. wanted to replace a paper-based system for performing retail audits used to gather information about McCormick brands in over 28,000 retail stores across the US. The existing system was inefficient, with significant delays between performing audits and delivering results to retail managers. McCormick deployed Flowfinity Actions to conduct retail audits of in-store merchandising compliance using smartphones, allowing field representatives in the field to exchange timely, critical data more efficiently with head office, sales executives, brokers and merchandisers. 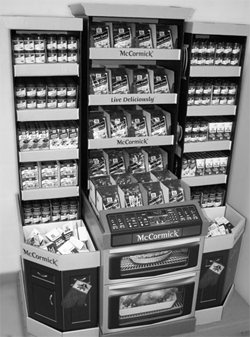 "McCormick needed a standard core audit procedure, where everyone across the nation agreed that this was how they wanted to measure retail execution," said Steve Warrington, US Consumer Products Business Systems Manager, McCormick & Co.
McCormick’s U.S. Consumer Products Division is responsible for the sales performance of McCormick products in retail stores, which is strongly linked to how the products are displayed on store shelves. The division uses retail audits to monitor the quality of in-store product displays managed by their merchandisers, in this case, third-party brokers. Previously, retail audits were paper-based, requiring retail operations managers to handwrite their observations and manually enter the data into spreadsheets at the end of the day or week. With this process, it took extended periods of time to collate and communicate audit results to retail sales managers. Given that retail conditions change so rapidly, this made it difficult to influence performance at the store level. The paper-based audit process caused difficulties in accurately measuring broker performance. If an audit revealed that a retail section did not meet pre-defined goals linked to sales, it often took too long for the results of that audit to reach the broker in order to effect change. As a result, many opportunities for addressing observed issues and initiating corrective action were lost. The Consumer Products Division also lacked a standardized audit process across the country. With different consumer business managers creating their own forms and audit questions, McCormick was unable to obtain or leverage valuable data on a national level. "McCormick needed a standard core audit procedure, where everyone across the nation agreed that this was how they wanted to measure retail execution." McCormick first selected a wireless solution from an ERP vendor to automate retail audits, which in should have addressed many of the shortcomings of the paper-based system. The solution consisted of one long form that required an uninterrupted Internet connection to complete. Usability issues made this system extremely cumbersome. Its limited search ability made it difficult to retrieve store details, prompting auditors to spend valuable time pre-planning and loading data for stores they were scheduled to visit before they set out for the day. Often entire audits would be lost if the Internet signal dropped, forcing auditors to start over. And since the audit form was one long continuous document that was difficult to navigate, field personnel found themselves backtracking as they tailored their route to match sections in the form, rather than taking the most efficient route through the store. All of these factors caused significant losses in efficiency, to the point where staff refused to use the new solution. This, combined with the fact that the system offered minimal reporting capabilities, caused McCormick to revert back to conducting paper-based audits, while continuing to seek out a different wireless solution that would truly enable them to improve business operations. "I had the misfortune of being involved with the original audit solution that we pioneered four years ago. It was cumbersome to navigate, with continuous connectivity problems, and we had no way of closing the loop with the broker," said Frank Duffy, VP Sales Eastern Region, McCormick & Co.
Having seen the Flowfinity solution in use in other leading CPG organizations, McCormick selected Flowfinity Actions as their standard mobile enterprise solution to automate retail audits across the U.S., achieve sales excellence, and closely monitor retail execution. McCormick chose the Flowfinity system for its ease of use and functionality. The software has allowed them to streamline and standardize the audit process across the country. Communication flow has improved internally and with third-party brokers, and overall sales operations efficiency has improved with auditors spending less time on low value-add activities such as data entry. Flowfinity Actions is easy to use for auditors in the field. Audit forms are now customized to meet McCormick’s specific needs and tailored to maximize efficiency, leaving more time for selling activities. Auditors no longer have to go out of their way in stores to observe sections or brands in the order in which they appear on the audit form. Now, forms are separated into specific sections, allowing auditors to walk systematically from aisle to aisle and navigate quickly to the section they are in, saving valuable time. The quick look-up ability in Flowfinity Actions eliminates the need for auditors to pre-load stores that they plan to visit. Now they can search for and retrieve store data within seconds as they arrive. The search returns relevant results even if the user simply enters a portion of the information, such as the first few letters of a street name or city. Connectivity is no longer an issue. Audits can be completed without a wireless connection. If a loss of signal occurs, the data is stored and automatically sent as soon as connectivity is restored. And if auditors are connected, they can take a phone call or send an email during an audit without loss of data, then simply return to Flowfinity Actions to complete the audit. In the previous wireless solution, entire audits could be erased by an incoming phone call. Management also enjoys efficiency gains with Flowfinity Actions. Forms can be easily tailored with components such as check-boxes and drop-down menus, both speeding up the audit process and improving consistency of the data. "The ease of use really shows how Flowfinity designed the software with the end user in mind. 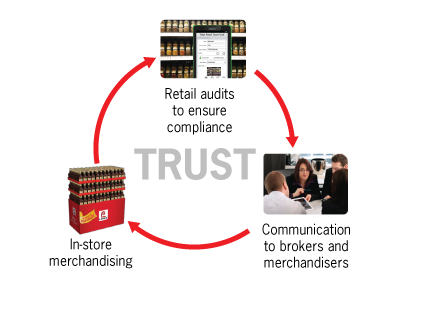 Finding the proper stores at the beginning of the audit is simple and fast, and maneuvering around within the software while performing the audit is equally efficient," said Rob Santin, Director of Sales, McCormick & Co.
"With a solid communication process after audits are performed, it allows us to close the loop on current issues, store by store." The U.S. Consumer Products Division relies on third-party brokers to manage in-store merchandising and promotion of their products. The ability to close the loop in communicating with these brokers by providing fact-based, timely feedback on retail conditions is key to maximizing sales. Previously, communication in the "Circle of Trust" was seen to be inefficient. Important feedback about McCormick’s key performance indicators such as out-of-stocks, planogram integrity, top SKU placement, or section maintenance could take up to a month to reach the broker. Often issues needing corrective action reached the broker too late or not at all. Now, audit results are available to be shared as soon as the auditor completes them. The information path is more streamlined internally, allowing information to be accessed and shared with much less effort. Valuable, timely feedback enables district supervisors to close the loop by verifying that brokers have taken corrective action when needed. "With a solid communication process after audits are performed, it allows us to close the loop on current issues, store by store," said Santin. Better information allows retail trends to be more easily identified, such as high out-of-stock rates in a store. The ability to quickly customize and structure audit questions, submit results, and extend the depth of information gathered during audits have allowed McCormick to streamline reporting, which is now considered by sales executives to be exceptional. The value of audit reports is further improved with integrated picture-taking features available in Flowfinity Actions. Now, auditors are able to take pictures of products in stores and embed them directly into the appropriate section of the audit form. These photos are an effective way to communicate to executive leadership the areas needing improvement or areas that are functioning very well. Quality data and reporting is now also fully accessible and traceable. Retail sales managers can take advantage of Flowfinity’s server-based ‘filing system’ to pull results of any previous audit from across the country anytime, anywhere. This was extremely difficult to do with the paper-based process. "The new reporting system is really fast. All of the audit data is submitted overnight, and can be reviewed by anyone in the sales department, up to daily if needed. Retail managers can download a report, highlight the issues, and disseminate that information to brokers," said Randy Sullins, VP Trade Relations, McCormick & Co.
Flowfinity Actions has enabled McCormick to deploy a single, standardized, and adaptable audit process to address core reporting requirements in retail segments across the country. Retail managers in different regions are now able to collaborate on the best ways to streamline and improve operations. The flexibility of Flowfinity Actions allows audit questions to be easily updated without programming and specific regional reporting requirements can then be accommodated as extensions to the core process. This gives sales executives the ability to roll out specific audit sections that focus on new products, or seasonal themes such as grilling. Now McCormick can make continuous improvements to their audit process, and deploy best practices quickly and consistently to every location, enabling merchandising excellence across the company. "Our entire field sales organization now has the tools and capabilities to confidently conduct retail audits directly on their smartphones." "During all of our training sessions, user acceptance of this new technology was extremely high. Our entire field sales organization now has the tools and capabilities to confidently conduct retail audits directly on their smartphones, for the purpose of improving overall retail conditions, which we expect will lead to improving overall sales," said Kevin Keelan, Sales Technology Manager, McCormick & Co. Currently the solution is used in the grocery channel, which represents the majority of their retail business, but McCormick plans to extend its use of Flowfinity Actions into other channels, such as drug stores and dollar stores. Audit forms will also be further customized to include specific seasonal, holiday, and promotional audits. McCormick sees the opportunity to extend the use of Flowfinity Actions to other departments such as Marketing, where they will be able to link pre-determined product placement plans to sales performance. "Additional significant benefits from the new software and process will come from our ability to use the growing audit database to help identify common issues and opportunities across sections, customers, or markets, enabling us to focus our efforts in a more targeted way," said Santin. With a solid communication process after audits are performed, it allows us to close the loop on current issues, store by store.